Coffee Crunch Cake is the Queen’s absolute favorite birthday treat. Picking one up at Stickney’s restaurant in Palo Alto (sadly, now gone) was part of the drill for her big day each year. 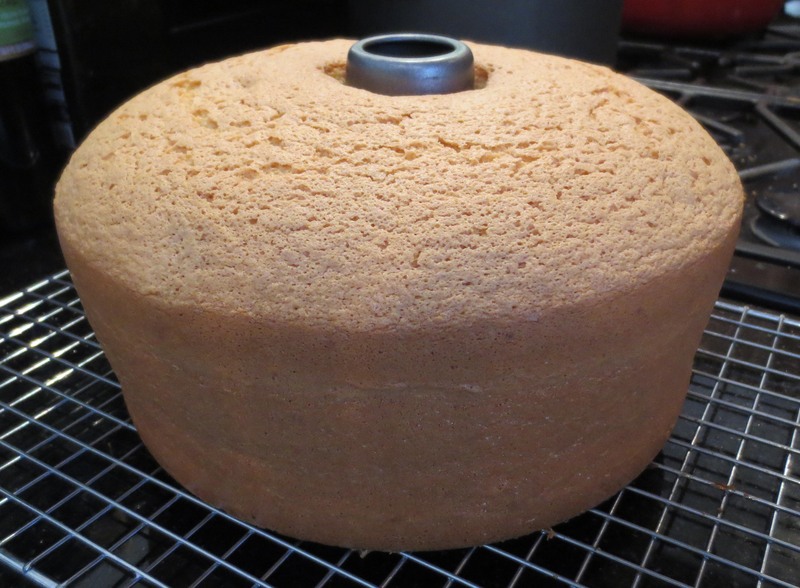 This year, Dad (not much of a baker), is finally making one from scratch to help us celebrate, although now far from California. 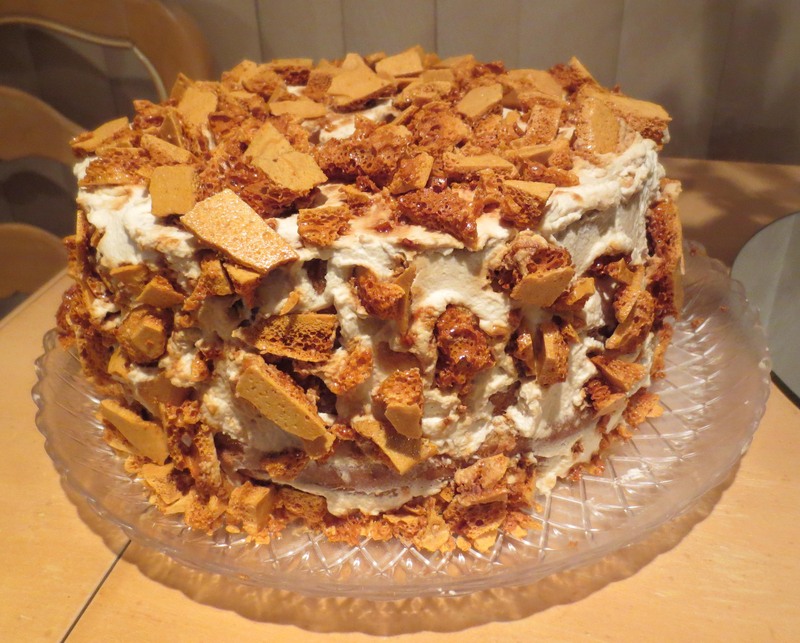 Coffee Crunch Cake is an assembly of three components: a vanilla sponge cake, coffee-flavored, whipped-cream frosting, and home-made coffee crunch candy. I found at least half-a-dozen recipes for CCC on the web, but Martha Stewart’s proved to be authentic, the easiest to follow…and produced a wonderful result. See the recipe for detailed ingredient list and steps. Dad is no baker. I’m just sayin’. So this became obvious in making the whipped-cream frosting. Learned some stuff. Don’t add hot coffee to the egg whites! The Queen had to rescue me. Coffee crunch cake gets its name from the coffee-flavored brittle pieces that you stick all over the frosted cake. (See final product photo below.) 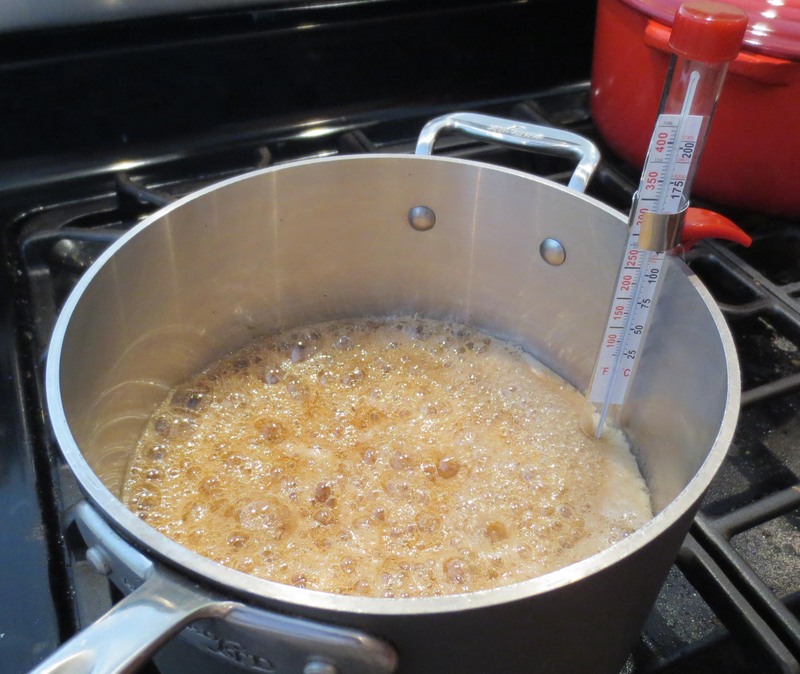 To make the brittle, cook corn syrup, coffee and sugar together until 310 degrees is reached on a candy thermometer attached to your pot. Candy thermometers are available at any grocery store in the kitchenware section for about $8. As soon as the magic temperature is attained, remove the pot from the heat for 10 seconds, and then sprinkle and whisk in one tablespoon of baking soda. Carbon dioxide gas will be created and the mixture will foam up the sides of the pot. This is why it’s very important to use a large pot for what is initially a small amount of mixture. We don’t want any spills or burnt fingers! 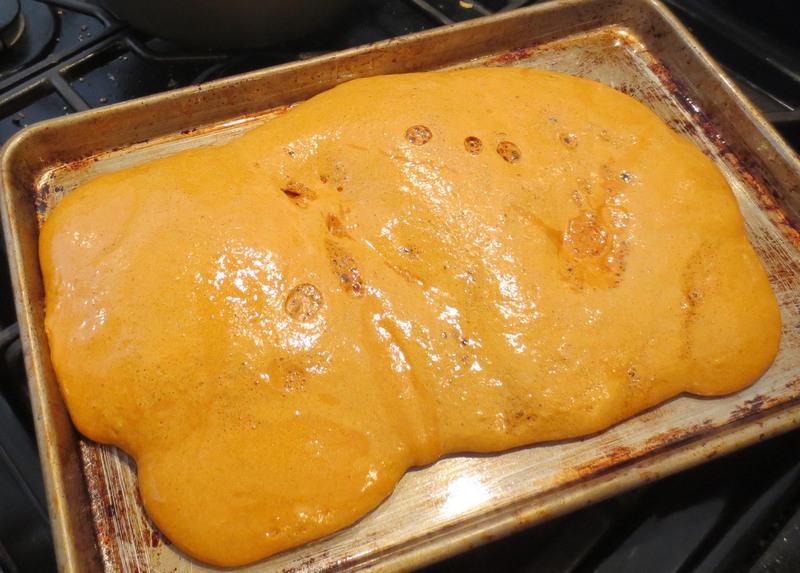 The foaming will subside quickly and as soon as it does, pour the mixture out onto a greased (with vegetable oil) sheet pan. Yikes! It’s the blob! What looks like golden mud will, after cooling for at least 30 minutes, become a hard, foamy coffee candy. Break the mass up into small pieces (average size 1/4-1/2″) and adhere handfuls of them to the sides and top of the frosted cake. Finally, when all the crunch was stuck on and we let the cake cool in the fridge for an hour, voila!, behold the real deal. Nobody more surprised than yours truly. It was delicious.